Your regularly scheduled Tiara Thursday post will be up tomorrow, but for today: The tiara-wearing streak rolls on! ...and rolling on with a white tie return banquet. (Click here for some photos, here for a video.) White tie return dinners (and the tiaras that come with them) are something we don't see so often these days, as things grow ever more informal, so this was a nice touch. 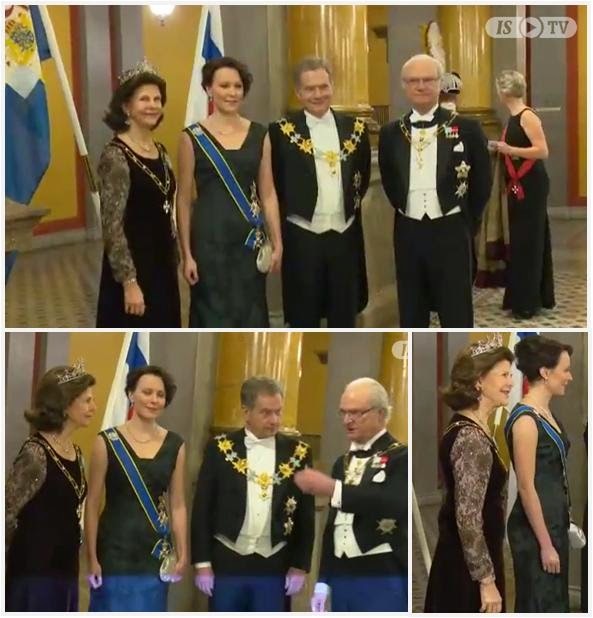 Credit where credit is due, the banquet has tiara power with or without the Duchess, courtesy of the Lord Mayor's wife, Gilly Yarrow (seen above, far left). Her tiara, a nice diamond scrolling number, is one she's worn previously. So that's a triple tiara watch for the day, I guess. Not too shabby. A state visit that includes a trip to Downton Abbey (for first lady Angélica Rivera and the Countess of Wessex) is my kind of state visit. Now, is somebody going to do us a kindness and wear a tiara out tonight so we can keep this streak rolling, or what?